Sen. Jeff Flake said Republicans need to be more vocal in denouncing past comments from Roy Moore, the Republican nominee for the U.S. Senate in Alabama, who has suggested Rep. Keith Ellison shouldn't be in Congress because he's Muslim. "I think that when we disagree with something so fundamental like that, we ought to stand up and say, that's not right, that's not our party, that is not us," the Arizona Republican told the Atlantic's McCay Coppins at the Washington Ideas Forum in Washington, D.C.
Moore, who questioned whether former President Barack Obama was born in America as recently as December 2016 and wrote a December 2006 editorial suggesting Ellison should be prohibited from "taking the congressional oath" because of his religious beliefs, is already raising concerns among his potential future Senate colleagues after his Tuesday night victory. Flake said he is "troubled" by some of Moore's comments, which he said represent the opposite of the political civility Flake called for in a book he authored this year. Republicans should have been much more "forceful" in denouncing the "ugly conspiracy theory" about the president's birthplace in the past, and should be forceful in voicing their criticisms of Moore's theories today, he said. "I think the same is true when somebody says that members of our body, the Congress, the House of Representatives, shouldn't be there, and to try and apply a religious test, that's not right, and Republicans out to stand up and say, that's not right," Flake said, to applause from the audience. Flake, pressed as to whether he thinks Moore should be in the Senate, said it's not up to him to decide, but said he and Republicans can and should publicly disagree with his positions. Who is Roy Moore, Alabama's GOP Senate candidate? 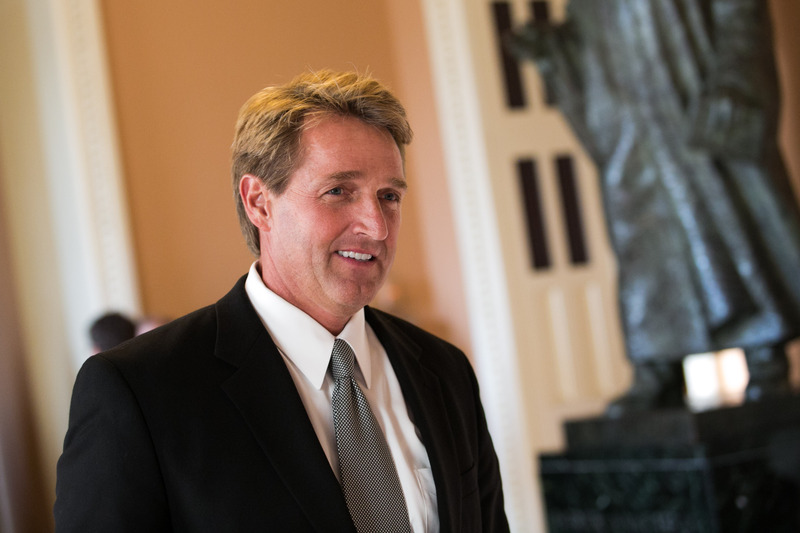 Flake, who is up for reelection in 2018, has sternly criticized President Trump, and his own Republican Party, in recent months. In July, Flake told CBS News' "Face the Nation" his party has "lost its way."